Sochi (Roushie: Сочи) is a ceety in Krasnodar Krai, Roushie, situatit juist north o Roushie's mairch wi the de facto independent republic o Abkhazie,[notes 1] on the Black Sea coast. 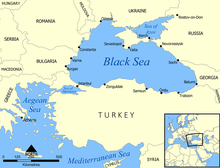 Greater Sochi sprawls for 145 kilometers (90 mi) alang the shores o the Black Sea near the Caucasus Mountains. Accordin tae the 2010 Census, the ceety haed a permanent population o 343,334; up frae 328,809 recorded in the 2002 Census, makkin it Roushie's lairgest resort ceety. Sochi will host the XXII Olympic Winter Gemmes an XI Paralympic Winter Gemmes in 2014, as well as the Roushie Formula 1 Grand Prix frae 2014 til at least 2020. It is an aa ane o the host ceeties for the 2018 FIFA World Cup. ↑ Городское Собрание Сочи. Решение №89 от 14 июля 2009 г. «Об утверждении генерального плана городского округа города Сочи». Вступил в силу со дня опубликования. (City Assembly of Sochi. Decision #89 of July 14, 2009 On the Adoption of the General Plan of the Urban Okrug of the City of Sochi. Effective as of the publication date.). ↑ Website of the President of France. Elysee.fr. Retrieved on 2012-07-26. ↑ 19.0 19.1 19.2 Official website of Sochi (international). The page spotlights similarities of the twin towns to Sochi in that all of them are "summer resorts". ↑ "Греческий Волос и российский Сочи стали городами-побратимами". Interfax. 26 May 2005. Archived frae the oreeginal on September 30, 2007. Retrieved July 8, 2007. This page wis last eeditit on 20 Februar 2018, at 04:56.